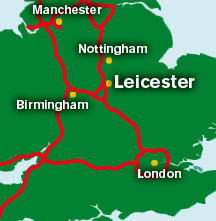 The first map is of the UK showing major cities including Leicester. 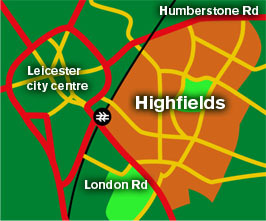 The second is a map of the East of Leicester showing the Highfields area. The following map of Highfields is taken from Ordnance Survey maps of 1938.The Highfields area is outlined in purple. The coloured circles show the distribution and functions (in 1938) of certain buildings. Click on an area in one of the grids to go a larger map of that sector, in which the circles and other icons are interactively linked to information, recollections or recent photographs (taken in 1998) of these same locations.